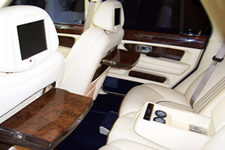 PHOENIX - A classic Bentley, owned by Michael Jackson (news) and featured in a music video, will be sold at the Barrett-Jackson classic car auction this weekend unless company executives hear from the pop singer himself. Craig Jackson, president of Barrett-Jackson, said that his firm entered into a contract to sell the vehicle in October — prior to the child molestation charges leveled against the singer — but are unsure as to whether the pop icon still wants to sell it. "We just want to do what he wants us to do and we don't know what that is," Jackson said. Jackson, who is not related to the singer, told the Associated Press that company leaders have had "numerous discussions about the status of the car with several representatives of Michael Jackson's management team." "These discussions have resulted in mixed directions about the car's status for the auction," Jackson said. However, because the original documents were signed by the singer, Jackson said his company needs to hear from the singer by noon on Saturday if he no longer wants to sell it. "Despite our repeated attempts to gain clarification, we have not had any verifiable direction," Jackson said. The four-day Barrett-Jackson event is expected to draw about 400,000 people to Scottsdale where classic and antique vehicles are sold for prices that have often reached more than $100,000. 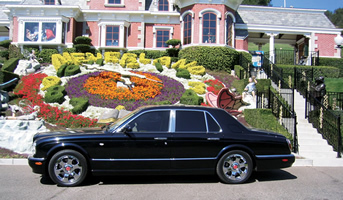 Jackson's car, a 2001 Bentley Arnage Red Label Turbo, was featured in the "What More Can I Give" video produced by Jackson. 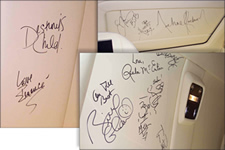 The metallic blue car is signed by Michael Jackson and several other celebrities and has been customized, Jackson said. Jackson said the vehicle itself is valued at $150,000 but with its customization and its celebrity status, will likely sell for much more. "It could bring a half a million dollars," Jackson said.